mwe3: Can you tell us where you live now and where you grew up? What were your early musical studies like and what instruments did you study and play early on in your career? How about early bands and concert performances? Frank Steiner, Jr.: I grew up in South Germany, Black Forest near the city of Freiburg and I still live in that region, as I love the wonderful environment with lots of woods and meadows. At about eight years old I had my first piano lessons and two years later I started playing trumpet in a fanfare corps. With my trumpet I joined several brass orchestras and when I was about 17 I joined a jazz band playing swing and Dixieland. At this same time I joined a pop band. They were looking for a trumpeter for their brass section. Soon I started playing the keyboards and wrote the arrangements for the brass section. Later on I wrote my first pop songs. After high school I joined the brass corps at the German Military. mwe3: What music were you attracted to early on in your life? Did rock and jazz play a part as well as classical? Frank Steiner, Jr.: I remember when I was a child my father often played classical music of Mozart, Bach and Beethoven on the record player. So I was used to it, but I didn't get into it that much at this time. Later on I got to know other classical music, and Wagner and especially the late romantic era music found my interest. From there it was a little step to the great film scores of such composers like John Williams, Alan Sylvestri, etc. The biggest influence from the pop genre I got from ABBA. I am a big fan of Benny and Björn of ABBA. I love their musicals Chess and Kristina Från Duvemåla. Supertramp was my favorite rock-group and I still attend concerts by Roger Hodgson, when possible. 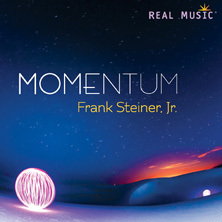 mwe3: Your 2015 CD Momentum is an instrumental music masterpiece. Would you describe it as New Age based keyboard music and what other music genres do you feel your music goes into on Momentum? Frank Steiner, Jr.: As often when I am asked what kind of music I make I find it difficult to explain. When people hear New Age they often expect an esoteric background and I'm not esoteric at all. I just love to write music which I want to hear myself and which has a certain influence on my mood. The kind of music on Momentum, as well as on my other CDs, could be described as a soundtrack to an imaginary movie which arises while you are listening to the music and close your eyes. No concrete pictures, just atmospheres, feelings. On Momentum there are several genres of music combined. Classical soft-jazz, ethnic world etc..
mwe3: What are a couple of your favorite movie soundtracks and who are your favorite soundtrack composers? Frank Steiner Jr.: My favorite soundtrack composers are John Williams (Indiana Jones, Schindler's List, Harry Potter, etc. ), Alan Sylvestri (Forest Gump), Hans Zimmer (Gladiator) but there are a lot more really good soundtrack composers, too many to name them all. mwe3: Did you call the album Momentum as it has a kind of rhythm to it with interspersed percussion? How did you approach the percussion on the various tracks on the CD and did you tweak the album with various computer programs during the mixing? Frank Steiner Jr.: Yes indeed, that has been the inspiration for the name. 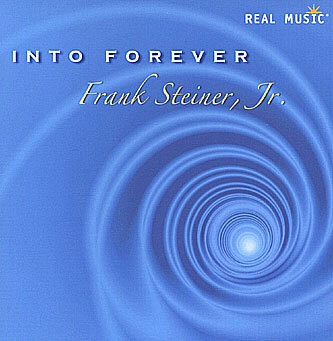 My last album Into Forever was really slow motion with almost no rhythm, just very calm. So with Momentum I wanted to add a bit more movement with slightly soft rhythms without being too intrusive. Of course I am using a computer to record my music, Apple with LogicPro. For the percussion on this album I used small hand percussion (shakers, small drums) and samples, but no loops. mwe3: What types of pianos do you prefer to play, practice and record with? Are you a Steinway player? Tell us about the piano you feature on Momentum. What can you tell us about the electronic keyboards you play on the CD? Frank Steiner, Jr.: Certainly I would like to own a Steinway Piano. I know this kind of instrument from a special perspective. My profession is (was) piano manufacturer. So for several years I learned a lot of the physics of a real piano, to build, to optimize and to tune them. Unfortunately it has remained a dream to own a Steinway or a Bosendorfer. But I am happy that today there are really great sounding sample libraries on the market. On the albums Into Forever and Momentum I used the Alicia's Keys model piano, the N1-Kontakt. It's perfect for those soft and subtle piano lines. On Momentum I also use lots of other sample libraries such as the Vienna Symphonic Library for the orchestral arrangements, Spectrasonics Omnisphere, and many more. 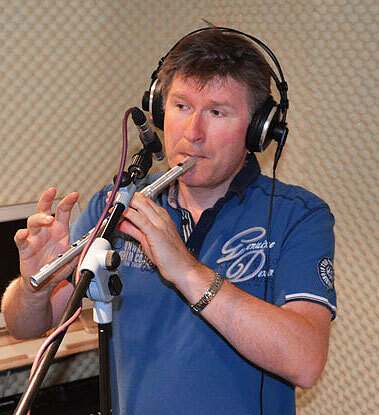 Live Instruments are: low whistle, trumpet - myself, traverse flute - Karoline Pleez, percussion  myself and vocals - myself, Karoline Pleez and Stephanie Maria Martens. 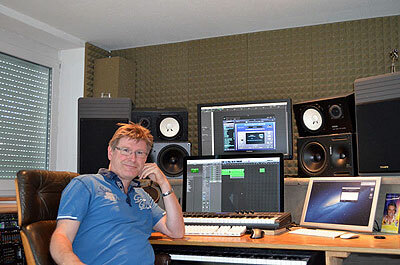 For recording, mixing and mastering I use Logic Pro and a lot of plug-ins. Every note on my recordings is played, no prebuilt phrases. mwe3: How did you meet Real Music and what do you think of their music and label philosophy? What are a couple of your favorite Real Music releases? Tell us about the other albums you released on Real Music and how they represent your music? 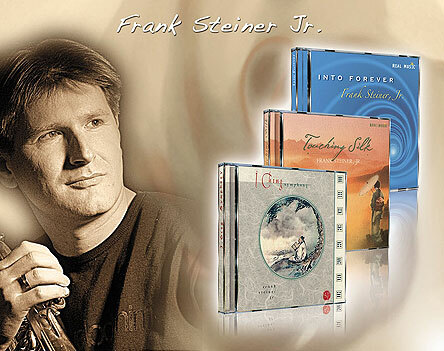 Frank Steiner Jr.: My first album was I Ching Symphony which I composed for the German label Erdenklang. Through this I got to know Terence Yallop who then invited me to produce more albums for them. I like how Terence and his company appreciate the worth of music for our well-being and I agree with their philosophy. There are a lot of really fine albums and artists in the repertoire of Real Music. I love the music of Kevin Kern for example; his style of playing romantic piano melodies reminds me of David Grusin, also a wonderful composer. Tim Wheaters Incantation, a really great album and very well produced. Thierry Davids The Veil of Whispers, also a terrific sounding and original album. There are indeed many more excellent albums in the repertoire although I don't know them all. mwe3: When did you become interested in Indian and Chinese music and how does your interest in World Beat and New Age contrast with your early background playing in the jazz-rock realm? 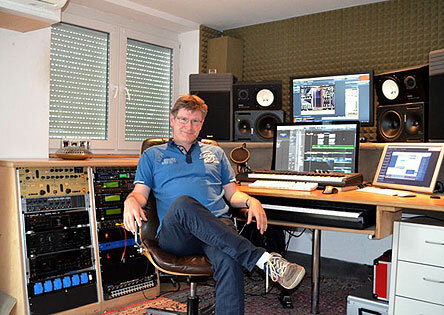 Frank Steiner, Jr.: My interest in Indian and Chinese music awoke while working with a German friend of mine Ullrich Gitschier with whom I produced my first album I Ching Symphony. The task was to musically interpret the eight signs of the I-Ging. So I limited myself to the pentatonic scale and used a lot of Asian instruments to create music with an Asiatic, flair but still pleasant to listeners outside Asia. Before that we had a project called Free Ethno where we mixed ethnic styles with pop. We combined everything that we thought would sound good together, no matter from which culture it was. Unfortunately we were not the only ones who had this idea. So the album I Ching Symphony and the connection to Terence Yallop from Real Music was my entrance to New Age music. Beside my own music I compose and arrange music for several other artists, too. Not only in the New Age genre, but also pop and folk. That's how I earn my livelihood. mwe3: What are you hoping people will say and feel after listening to Momentum? Are you trying to change lives for the better and to give listeners another perspective on modern music? Frank Steiner, Jr.: To claim that my music would change lives or is healing or something like this feels a bit overwhelming to me. But I am sure that music in general can have a positive influence on ones well-being and so on ones healthiness. The type of music that can achieve this is different from one person to the next, and is dependent on their actual mood. Sometimes I love to listen to the hard rock music of Rammstein for example, and it has an absolute positive influence on me, whilst another would run away.